Baby down rubbish chute mum 'lost control A mother has told a court she "lost control" of her thoughts before throwing her six-day-old baby girl down a tower-block rubbish chute. "> A mother has told a court she "lost control" of her thoughts before throwing her six-day-old baby girl down a tower-block rubbish chute. Jaymin Abdulrahman, "I lost control"
A mother has told a court she "lost control" of her thoughts before throwing her six-day-old baby girl down a tower-block rubbish chute. 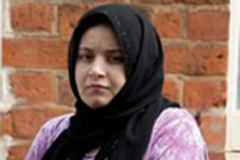 Jaymin Abdulrahman, 25, said to have been suffering from a post-natal psychosis, told Birmingham Crown Court she had not planned to harm her baby. She is accused of dropping her 40ft (12m) down the chute in Wolverhampton. Ms Abdulrahman has pleaded not guilty to attempted murder. She also denies causing grievous bodily harm with intent, and inflicting grievous bodily harm. The baby was found with serious head injuries outside a block of flats in the city last September. Speaking through a Kurdish interpreter, Iraqi national Ms Abdulrahman told the court she was in tears while cleaning her bathroom shortly before placing the baby in the chute. She said: "I was extremely sad... I went to the living room, I put the baby in a rubbish bag and I threw her away. "After I had done so, I just couldn't believe what I had just done, and I couldn't understand why I did it... I was in shock." The court heard Ms Abdulrahman was "tired, sad and exhausted" in the week after her daughter's birth. Defence barrister Rachel Brand QC said Ms Abdulrahman's mental condition was so severe it prevented her from forming an intent to kill or cause serious injury to her daughter. The depression amounted to a condition called postpartum psychosis, she said. Ms Abdulrahman as a "competent and loving mother", added Ms Brand.